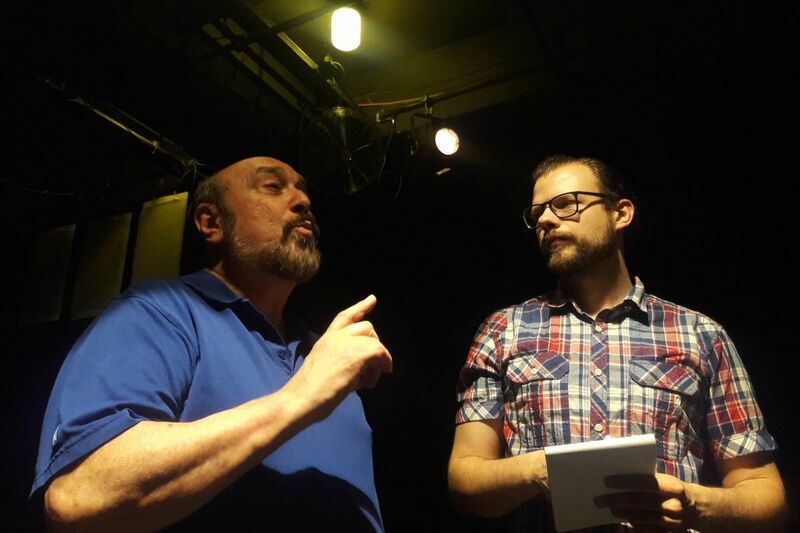 Gene Terruso (left), founder of BEST Divadlo, the first English-language theater in Brno, Czech Republic, confers with technical director Honza Čapek on stage. Some are born into the theater, some achieve the theater, and some have theaters thrust upon them. Gene Terruso had a theater thrust upon him – in the Czech Republic. One moment, he was a Fulbright scholar about to return home; the next, he was artistic director of the first all-English-language theater in Brno, a bustling, international, U.S.-culture-loving city. Terruso is former artistic director of Steel River Playhouse in Pottstown, longtime teacher of drama at the University of the Arts, and an actor/director with on- and Off-Broadway credits. He was finishing up (he thought) a Fulbright year. He'd been teaching at the Janáček Academy of Music and Performing Arts in Brno, directing plays at the Orlí Street student theater there. He also taught at Masaryk University, directing plays at the English department's student theater, the Gypsywood Players. The U.S. Embassy asked him to give a farewell talk (he thought) about recent U.S. television. So he did. "When the talk was over," Terruso says by WhatsApp from Brno, "I was coming down off the podium, and this guy was walking right toward me." "This guy" turned out to be the head of the English department at the University of Hradec Králové, a couple of hours away. He'd come to give Terruso an award, as in a visiting professorship, research money, and teaching to last another year. "And then the Brno Expat Centre calls me," Terruso says: " 'We've had tremendous interest in establishing an English-speaking theater. We heard you'd be around. Would you be interested?' "
Before long, he was running the theater called BEST Divadlo. Its first production, November by David Mamet, ran March 11-April 8, sold out, to great acclaim, and "we're already being asked to do it again," according to Terruso, "even take it to international festivals." For the record, BEST stands for Brno English Speaking Theater. Divadlo means "theater" in Czech. Also, for full disclosure, Terruso is the father of reporter Julia Terruso of the Inquirer and Philadelphia Daily News. He's in Brno for the duration, planning the theater's first full season, to start in the fall. The cast of David Mamet’s “November,” in front of BEST Divadlo (left to right): Aaron Collier, Dana Puková, František Maňák, Jeff Smith, Robin Schenk, and Ondřej Halámek. "Brno is a town that really supports the arts," says Don Sparling, a native of Canada and a retired professor of English at Masaryk, where interest in American studies is so keen that 800 students are pursuing that major. Sparling was a major force in setting up BEST Divadlo. He describes Brno as a cosmopolitan, theater-loving town. "It's a city of about 400,000 people, but it has, I'd estimate, around 40 theaters," he says. (Philadelphia proper, about four times the size, doesn't have quite that many.) "And English-language theater is very popular," Sparling says. BEST Divadlo co-founder Ivana Daňhelová, a Gypsywood alum, says, "I think Brno has always been that way." She says "the Czechs are quite a cultural and creative nation – when four people with the same interests gather, they are able to form a theater company or a music band." They had to find a place: a 50-seat space in the arts venue Kabinet Múz. They had to file paperwork for incorporation – three times. ("They kept sending it back," says Terruso.) The theater had to have a non-rented official address, so they used Sparling's. They had to set up a board of directors. They had to line up sponsors, like the communications company Deutsche Telekom. And they had to pick a play and assemble cast and crew. Casting was no problem: "Everybody knows everybody else," Terruso says, "and lots of people were interested in being part of the production." He says he chose November "partly because it has a cast of five, everyone wears business attire, and you need a desk and five folding chairs for a set." November is Mamet's 2008 comedy about "an absolutely terrible president," Terruso says, adding, "People connected with it immediately." Robin Schenk, a native Czech who has studied at the Berklee College of Music in Boston, landed the role of Archer Brown, chief of staff in November. "Gene is a great director," he says by phone. "He has in his head the way he wants everything to go, and we were able to complete rehearsals in only five weeks." Robin Schenk (left) and Jeff Smith in David Mamet’s “November,” the first production of BEST Divadlo, the first English-language theater in Brno, Czech Republic. The theater was founded by Philly-area theater professional Gene Terruso. And what did Schenk think of November? "The kind of humor Mamet has is really my kind of thing," he says. "At our first reading, at some points I couldn't stop laughing and had to rest between jokes. As not a native speaker, a lot of the jokes I didn't get the first time and had to ask native speakers what they meant. And many of them are local American jokes. Very local: The Americans and Canadians were saying, 'Some of this is so local, not even all Americans would understand it.' But when we did the play, I was actually quite surprised by how much the audience got the jokes." Jitka Kratochvílová went twice. An English and Norwegian major at Masaryk and a Gypsywood alum, she's a fan of Woody Allen, Tom Stoppard, and other dramatists. "When I learned that Gene Terruso was founding an English theater group here in Brno, I immediately joined," she said. "This was for the first time I have seen a play by David Mamet — though I have liked The Untouchables movie — and learned about 'Mamet-speak,' which I came to love immediately." "I feel an obligation to getting the theater further established," Terruso says, "which I think I can do by getting them through a full season of four plays. I've also started an educational program, a film series, and a public reading series of plays we're considering. All of those are giving us an identity in town." Among plays getting a look are A Walk in the Woods by Lee Blessing, Neil LaBute's Autobahn, The Archbishop's Ceiling by Arthur Miller, Copenhagen by Michael Frayn, and Sweat by Lynn Nottage – an ambitious lineup tackling deep political, social, and philosophical issues. So he's in Brno through at least summer 2019. Terruso goes home twice a year; spouse and family come out to visit. He says he doesn't know exactly when he will return to the States, or to what job. "But, hey," he says, "that's the theater life."